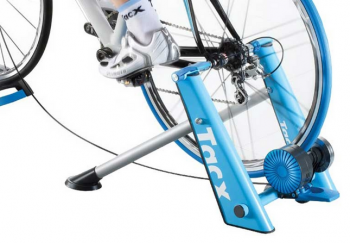 The Tacx Blue Motion turbo trainer is part of a new generation of cycle trainers. 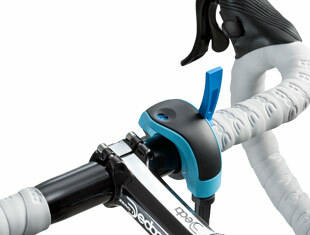 This bike trainer is the successors of previous popular Tacx models, offering fantastic value for money. 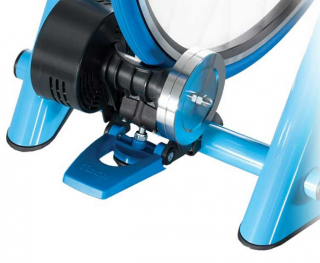 The Blue Matic trainer has a powerful brake that manages the resistance offered through the system, and a strong and robust frame, meaning it will easily cope with the high forces that you will push through it during your training. The Blue Motion turbo trainer is suitable for all standards of cyclist, so whether you are just keeping yourself ticking over until the snow melts, or you are a serious race competitor pushing yourself to your limits, the Blue Motion will suit your needs. The trainer has a simplified mounting system that makes it very quick and easy to assemble, meaning you have more time to get peddling. There is no need for a tool set to get started, so whether you have small or big wheels (even 29 MTB), you can get started easily without any faff. The Blue Matic uses a magnetic brake to offer resistance when you peddle, and consists of two discs each with six permanent magnets. There are 10 resistance positions that are controllable via a handlebar resistance lever. This means you can the position of the magnets in the brake unit using the lever and increase your resistance without leaving your seat. While you are training the resistance automatically increases when you cycle faster or when you are in a heavier resistance mode. 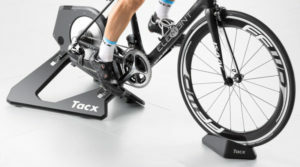 The maximum resistance of the Tacx Blue Motion turbo trainer is 700 Watt.